Air force blue is a beautiful colour. Better than the bright, tonic blues that are so popular these days – so much deeper, so much more subtle. Also known as RAF blue, the colour refers to the uniforms issued to the Royal Air Force when it was formed in 1920. It was said to reflect the blue of the sky, although was actually used because there was a surfeit of the cloth from orders for Russian imperial cavalrymen. Today many other airforces around the world use the same azure tone. Those uniforms were made in a much rougher cloth than this flannel, but its texture mimics it well. The colour would also be much blander without that texture – if you see it on RAF and other airforce badges, it has none of this appeal. Flannel gives it depth and subtlety. In terms of style and how to wear it, RAF blue sits halfway between navy and grey, but has the versatility of neither. It needs a dark tie to anchor it, and is helped by the sharp white of a linen handkerchief. My favourite combination for it is a navy grenadine tie, blue shirt and white hank. You could add some pattern to the shirt or tie, but that’s about it. The fit is just as good as the first suit: soft-shouldered, with a touch of flattering drape in the chest, and nicely suppressed waist. There isn’t much flare to the skirt, and the foreparts are only subtly cut-away (despite being a one-button). If I was going to nit-pick anything, it would be the shape of the end of the collar. It should probably be angled a little further up, widening the notch shape, as the lapel itself is not similarly angled upwards. It’s not something I noticed until the end of the process, but we can change it later. The make is very good, although only superior to the Indian-made Classic Bespoke in a couple of small ways, as I described on the earlier post. I would say this is good value at £3050 + VAT, were it not for the fact that Classic Bespoke is even better. You can follow the discussion on Air force (RAF) blue flannel suit: Whitcomb & Shaftesbury by entering your email address in the box below. You will then receive an email every time a new comment is added. These will also contain a link to a page where you can stop the alerts, and remove all of your related data from the site. Indeed, that is a beautiful colour. Where would you place this suit in terms of formality? and could you also explain why you think this would not work, say with the green tie you wore with the classic bespoke suit? It’s just too unusual a colour to work with anything bright. The only other possible options would be similarly dark – Browns, even dark greens maybe. Simon, would you consider the Air Force Blue for other pieces such as an odd jacket, overcoat or waistcoat? Yes for an odd trouser. Would you look nice with navy on top – though not a lot more. Lovely suit Simon. Agree with you on the tonic blue shiny abominations – I regularly see them worn with tan slip-ons. Not a good look at all. Mid blue can look awfully cheap in a worsted without any texture. Would I be mad to suggest a bottle green knitted tie and/or an orange pocket square? The navy tie and blue shirt you have on would be great with a grey flannel but the look as it appears above is perhaps too ‘blue’ for me. When working out colour combinations such as this, how do you approach when you’re not wearing the suit itself but you’re out looking for new pieces to go with it? , ie how are you sure the colours/fabrics are truly right together? Do you keep a fabric swatch of the suit with you? A follow up on colour, when pulling pieces together are you only interested in the fabrics & colours working with one another or do you also factor in your own skin tone? I’ve always believed I can’t carry off washed out/pale colours and certain earth tones but am wondering if it’s actually more a case of how those colours are paired. I do bear it in mind, but the effects can be mitigated, as you suggest. So pale colours can wash me out too in the winter, but if I wear a pale jacket, for example, the effect would be exaggerated by a white shirt, but mitigated by a softer warmer blue colour. A black tie would be harsher, a navy tie warmer. Absolutely lovely. Perfect fit, and, as you say, great depth of colour. I can definately see this working with either burgundy or bottle green for the tie, or indeed any of the three against a white shirt. The other option, and this is not something I am aware you have picked up elsewhere, is to go with a white collar (but not cuffs please) against a coloured shirt, as this extends the contrast still further. Love the color and the shoulder is superb. However, I’m confused about your choice of the one button model. Would you please explain this unusual model choice. In retrospect I might have gone for a two-button rather than one. A one button is usually more formal and better suited to the navy worsted I had made in the other make. Though of course many houses like Huntsman and Richard Anderson do one-button jackets traditionally, in all types of cloth. What shoes did you wear with this suit? Interesting. Personally I find Air Force blue tricky to colour match as it somewhat loses the neutral colour element that Navy maintains. I think in this instance the tone and texture look spot on! The final product retains a very fine silhouette – but with one small flaw – the flat/straight (vs. slanted) pockets. Visually it is incongruous as, without the second button to balance, straight pockets look to be set too low on the waist. I do not suggest slavish adherence to Huntsman but it’s famous one-button cut seldom comes without slanted pockets. It is only a personal view – I’m interested as to why you commissioned it this way? On a separate issue; colour matching (main background combinations, neutral, warm and cool toned accessories, complementary and analogous colours etc.) is an area that gives most men difficulty. Would it be possible to give readers some further guidance on this occassionally tricky matter. Quite a lot of Huntsman (and Richard Anderson etc) has straight pockets actually. Mine from them did. Your jacket is perfectly cut. For example, the middle button you close on its front is not too high, as unfortunately many are. – Can you explain why the RAF decided to choose just this blue? Have you spoken with Pantone about its peculiarities? Yes, I saw in Wikipedia at the article RAF uniform history such an assertion presented in fragment and as rumour, but there seems to be the view blue and azure and their respective shades must be distinguished, etc. And although only cloth is theme, no mention whjch English mill, no name of military tailor in London (Ede & Ravenscroft? ), nor designer (why St Petersburg, Russian cavalry chose England as source). Only the cloth was intended for the Czar’s horsemen, became available to RAF due to Bolshevik insolvence or refusal! Is that a Drakes tie? Do you use their standard length and width, or do you use made to order? Thank you. Do you mean 9 cm rather than 9 inches? Do you typically chose 8 cm or 9 cm width. Lastly, which ties do you tend to roll rather than hang when not in use? I imagine you roll your knit ties, but do you also roll large knot grenadines and wool ties, too? I tend to hang all of mine. I’ve never seen much evidence of them stretching when hung rather than rolled. And in any case given my height I wouldn’t usually mind if they were a tad longer. Thanks. And what’s your preferred width? Thank you for your responses. I also like to have my ties a longer length (approx. 157 cm), but there seem to be limited choices here in New York. I do like Drake’s made to order service through their website and trunk shows, but their selection can be a bit limited. I very much like the look of a lot of the Italian makers, including Marinella, Bigi Cravatte and Petronius, but I haven’t had any luck getting a made to order tie from them (their websites don’t offer MTO services and I haven’t received responses when I try emailing them). 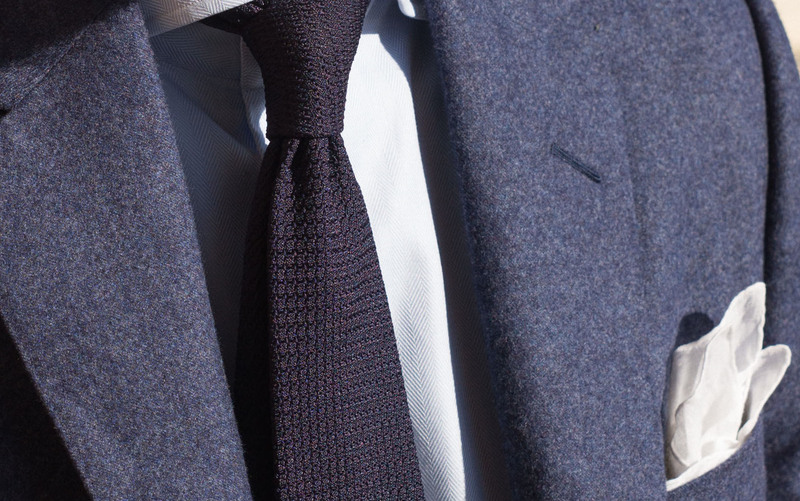 Other than Drakes, where and how do you get your preferred length ties? Have you tried EG Capelli? Allows you to specify width, length, folds, inter linings, tipping, etc in hundreds of fabrics. Patricio is responsive by email, and my two experiences have both been positive. Shipping to US is high, but could be a solution. What shoes did you wear with the suit? It really is a beautiful suit. I love the colour and texture. I also love flannel as a cloth, but I find it difficult to justify spending money on a flannel suit because as you say it’s not really business. I’m happy to wear the trousers if I’m just in the office, but a jacket seems a bit to much. I love the colour and cut, fabulous. Just wondered re your comments on weight at 290 grammes, would this be a practical office weight? also interested in your thoughts on one posters comments re white collar and cuffs, I am a fan of both…should I be locked away? It would certainly be a practical office weight, yes, but I would go slightly heavier to get the best out of flannel. Offices are different temperatures (particularly in different parts of the world), but I think even at 11 ounce you should be fine in pretty much any air-conditioned office. I’m not a big fan of white collar and cuffs, but the look can be done well. For me, it’s a more formal and striking look that should be worn at more formal occasions, and needs to be carefully balanced in terms of patterns and colours. Wei at the Rake does it well – often by using very strong contrast in suit or tie cloth as well, so everything has a certain contrast. I can imagine there’s a lot to consider before you publish something like that … any initial thoughts? The real question I have is: are W&S a no-brainer for standard business suits vs paying £4k + from the ‘usual suspects’, especially if it’s not that important to capture a particular house style or look? I’m at the point of my wardrobe build that I’ve got odd jackets and odd trousers across seasons, overcoats etc and the few occasional suits (e.g. DJ) all sorted and from tailors (Caliendo, M&M) I’ve come to know personally and enjoy working with. That said, money isn’t limitless and I’d rather the bigger tickets going forward are for non-business suits: the pieces I spend time thinking about and putting together with Elia for example, and that are enjoyed for what they are vs. what they are for. Of course I also don’t want to get caught up by the thrill of saving money only to realise in a couple of years that I should have just bitten the bullet, paid the extra money and stuck with what I’ve come to know in the first place … but if it all comes down to finishing (and everything that entails), it would be great to get your thoughts about how W&S stands up to C&M, A&S, Caliendo and the myriad others you have. Apologies Jon, you’re right I was going to go into that in more detail. I’m happy to later, but your thinking is absolutely correct. W&M don’t lose anything really in the quality, the make etc, so it’s just about those extra details and the styles etc that you like. They would make a great place to go for those business suits. A lovely suit in a lovely cloth. I’m usually concerned about the durability of flannel, especially in lighter weights, would you see this cloth falling victim to sagging or losing its nap? Also as a matter of interest, did your commission include 2 pairs of trousers for that price? Yes, that would definitely be an issue. Another reason to go for a heavier weight. No, I just went for one pair of trousers. I’m afraid I have so many suits that I’m less concerned about that these days. None of them will ever get very heavy wear. How many, just out of interest? Please don’t make me think about it…. Can you elaborate on what you mean in regards to the collar angle i.e. that it should be angled a little further up. It looks perfectly fine to me imo, a very traditional shape. I would have gone for wider lapels though. Hi Simon, what shirt are you using? Sorry for asking but do not see any comment on it (or I was reading too quickly…) Thanks, great suit and colour. And of course, I’ve watched the pics above many times, and especially the relevant area of the jacket. Frankly, I don’t think it would be a good idea to make changes as you appear intent on doing, even if a whiff of Italian tailoring would seem appealing! This is really a lovely a jacket as it stands right now! 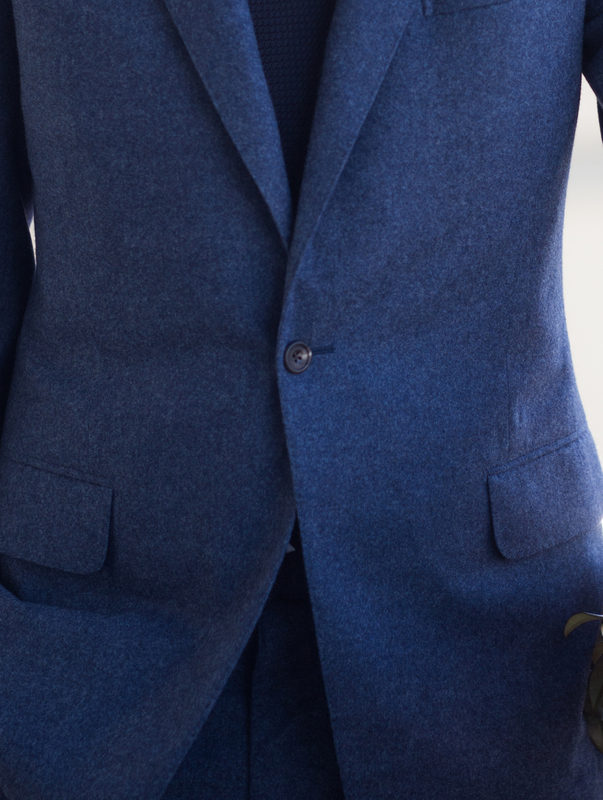 Well balanced one button configuration coat and the color RAF Blue is beautiful and versatile. Thank you Simon I think I’m going to take your advice on the shirt and tie and will consider the socks. As you know, I ordered my first bespoke suit from W&S, a nice navy worsted wool 13oz. Previously I have always bought M2M suits, which were fine but will gradually be phased out over the next couple of years as I add more bespoke from W&S. I currently have a dark navy pin, mid/dark grey pin, light/mid grey herringbone, mid grey PoW and a navy wool/cashmere. I love the RAF blue you posted, and I am considering getting one made in the same material but DB (as I do not have a DB in my collection, and think it would look lovely in this colour). My question is, should I pull the trigger or go for something a bit more conventional as I am looking to phase out the other suits? I mean for example, a charcoal grey flannel or grey flannel pin, or navy chalk stripe flannel/window panel? I will wear the RAF blue suit for work, and I do work in an office, but it is not stuffy. I appreciate it won’t be as versatile as the grey charcoal flannel, but I would wear it once a week or two with a white or light blue shirt, dark navy/brown/burgundy/green tie and a simple square and probably top off with a nice pair of dark brown shoes or even my navy shell shoes (a dark rich navy). What do you think? As you can see, I am looking for an excuse not to buy it! I love the look and saw the material in person at my last fitting with W&S. Hello Simon, what kind of pocket square fold is that one you’re wearing here? Although I’ve searched & read, I can’t find your opinion on silk blends (50%-50% silk-linen vs. 50%-50% silk-cotton) for jackets? PS: You don’t like 100% silk for a jacket? Yes, a blend does decrease the disadvantages of any of the fibres on their own. Generally a mix of wool, silk and linen is the best, but cotton can be good for a more casual look. It’s what most of the Italian summer jacketings are made of. And no, I generally dislike 100% silk. A mix is usually more practical. Have you tried/considered Whitcomb’s shirts? I have recently picked up my first suit from W & S, a single breasted suit in the same air-force blue flannel as that made for Simon (just with wider lapels) and I have to say I couldn’t be more pleased with the finished product, the fit is wonderful and it is extremely elegant. All round my experience with W & S was first rate and I would highly recommend them if your after a ‘Classic’ style of bespoke suiting. They are also great fun to work with. Top notch! Why is it less versatile as a sport coat than navy? I sometimes think that navy is to formal for most “sport coat and flannels” offices. I bought a suit in exactly this cloth and is sometimes using the jacket separately (its napolitan and with patch pockets). One more question. Would this color work with a lighter grey poplin shirt? It is often too close to the grey of trousers for there to be enough contrast between them. Or the shirt and tie have to work hard to establish that contrast. It’s also not great with colours such as tan or brown. Navy is formal though, as you say. Would sit well with cream and white. And I reckon other more pastel colours. But that’s probably too dandyish for the office. Would you recommend cavalry twill for a hard wearing business suit? Also, Do you think W&S would be able to change their house collar and lapel so that it looks a bit more like a Solito lapel (e.g., higher gorge, slightly wider lapel and more open notch)? Or is lapel and collar shape something tailors are not very good at adjusting? If your office isn’t too formal, yes. It will look different to a normal worsted, but certainly be hard wearing. If flannel would be fine, cav twill would likely be too. W&S might well be happy to do a broader lapel and higher gorge. More open notch is also possible. These things are easier to change that the shoulder line or drape, for example. I’ve watched this thread developing with interest and, having had several MTM suits, including from G&H, I’ve decided to take the plunge and dip my toes in the waters of bespoke, with a Classic Bespoke from W&S – first appointment tomorrow! From everything I’ve read here, W&S Classic Bespoke seems to be a good entry point for a first time venture. Great blog/website, by the way, Simon. I just chanced upon this blog today, having been curious about your second W&S commission. The cloth is fantastic and the cut of the coat is truly superb. I would welcome a full body shot to get a sense of how the trousers work. I have a question – I notice the buttonhole on the lapel is cut at a rather jaunty angle. I’m more familiar with them being horizontal – what’s the convention and does the angle on this coat imply less formality? They’re normally cut parallel with the top of the lapel, so it depends on what the angle is there. That’s very much a style thing and varies between tailors and over time. No, it doesn’t make the coat less formal. 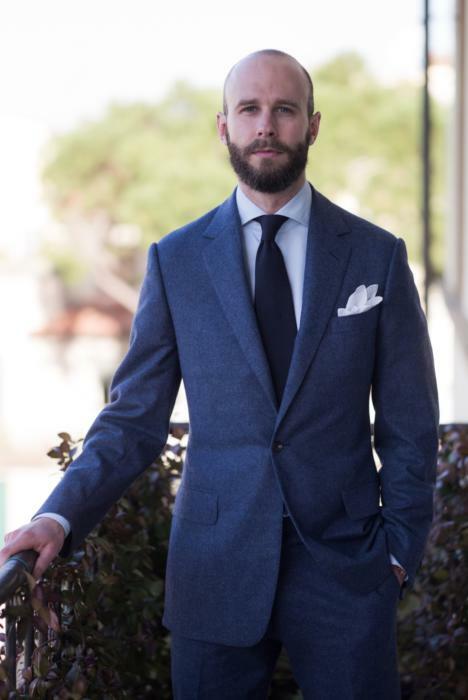 I’m going for my first MTM suit, and from the available/affordable fabrics I’m most attracted to a dark navy flannel from the same Ariston range (290g). I know you’ve said this is not an ideal weight for flannels. It’s my first/only suit and realistically I’ll only wear it to special occasions (not work), so hard-wearingness is not the first concern. I just want something that looks great and will be a delight to wear occasionally. How do you feel about this fabric, two years on? I appreciate your website very much – a wealth of information. I just realize that since Ariston measures the weight per linear metre (1×1.5m), 290g isn’t 10oz in English terms (1m2), but a mere 7oz! Seems very light indeed compared to the weight you normally recommend for flannels (±14oz). Yes, it makes them all a good bit lighter. The flannel comparison isn’t necessarily a direct one, but yes that is very light. Hi Simon – how wide are the lapels on your W&S suits? Could this flannel work as a sports coat or is there the exact shade for strictly blazers in the Ariston book? Also, what are your thoughts on the W Bill Phoenix bunch 14821? It’s a unique color very similar to navy. I don’t like flannel for sports coats generally – not quite enough texture. Do you know of any RAF sportcoat fabrics in this shade? Also, I still have yet to find something similar to the yellow SherryTweed fabric for your B&Tailor jacket and your LP oatmeal cashmere jacket. Anything catch your eye so far? I saw some light fawn colored flannel, but that would be for suiting, not a sportscoat. I am getting a suit made for my upcoming wedding this summer. I want to go with a British tailor versus an Italian. Would you ever consider getting a one button jacket for such an occasion? I was planning on getting a two button single breasted suit made but really like the style of this suit. Would it be too affected? Would appreciate your thoughts. 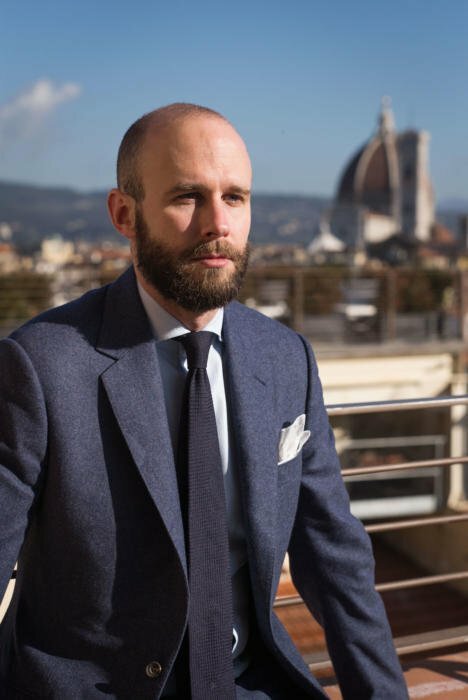 It would definitely be more rakish, and a little risky, so I’d steer away from it unless everything else is quite classic – grey or navy, notch lapel etc.